Supporting another imminent leap forward within the etrading space? ASP model is key for buyside desktop? We believe future growth will come from small firms and hedge funds gaining OMS capabilities delivered via an application service provider (ASP) or software-as-a-service model, rather than installed software. As of mid-2006, LatentZero did not offer its product in an ASP model. Therefore, it is likely that this acquisition stemmed from a lack of sufficient future growth opportunities at LatentZero, given low or slow sales increases for its traditional product offering. I’m not convinced majority of buyside are against an installed app per-se, providing it is easy install and subsequent update, and does not burden them with huge requirements for ‘local’ support. With LatentZero reassuring customers that nothing will change for two years under the conditions of the £63m (€92.5m) deal this is clearly a foundation for the long-game. For now LZ will operate as a separate entity within the Royalblue group, and its management team will stay with the company. Watkins (co-founder of LZ) sees electronic fixed-income trading as part of the future because the liquidity is much more dispersed. He says there is potential to let the sell side share their liquidity on a targeted basis to their clients. “That means we would essentially be allowing both sets of clients communicate with each other on a private basis, as opposed to participating in an ECN or ATS,” he explains. “ I think for certain asset classes that is going to be the way that people want to work,” says Watkins. So what is the definitive list of OMS with any presence to note in the fixed income space? Is anybody else really making any headway into FI? WSJ says “The New York Stock Exchange plans a pilot program later this year that could bring real-time stock-price data to millions of Internet users.”If the SEC approves the NYSE plan it will allow web sites to publish trade prices with nearly no delay in return for payments of $100,000 a month. The test program could be available as early as March, depending on the SEC’s response, the paper said. Google Inc. and business news television station CNBC have said they would offer data for free to their users, the paper said. NYSE is keeping some data close to the vest, including the size of trades, and the quotes at which investors are willing to buy and sell shares. That information is available on the floor and to Wall Street firms and institutional investors for a charge, and is made available to customers of some brokerage firms, which usually wrap in the costs as part of investors’ commission payments. The consolidated plan, available through brokerage-firm sites, includes prices, quotes and the size of trades on all U.S. exchanges, whereas the free information that Google, CNBC and possibly others will feature will show only the last trade price. But CNBC officials say the data will also be used to feature charts and updated information about market movements. How long before we see generic OMS / EMS functionality available through a Google spreadsheet? With the setup of your trading access giving you the rest of the data that isn’t free? Wall St Tech says Thomson have launched a new OMS TradeCentral – article here – billing it as an end-to-end multi-asset class solution with out of the box connectivity into Tradeweb for fixed income, as well as supporting equity markets and venues for options and other derivaties. Interesting question in here about quantifying the value added by the dealing desk in terms of alpha in the funds performance. Equity traders at fund management firms are having to prove they earn their keep. It is a challenging time for buyside equity dealers. Swamped by technology, targeted by regulators, scrutinised and measured as never before, dealers must also fend off the threat they should be dispensed with altogether. Advances in trading technology mean fund managers can for the first time realistically consider outsourcing equity dealing. While some firms have invested heavily in updating their dealing desks, others are only beginning to assess their capabilities. With better analysis of trading performance, the contribution of the dealing desk to fund performance can be isolated. The problem for many dealers is that in stark numeric terms, even the best are likely to have only a marginal impact on returns. If the choice of execution venue and way the order is executed doesn’t have a material impact upon the return achieved then what the hell is all this fuss about best execution? If the problem is actually that an execution desk costs too much and so eats up any alpha they achieve through clever execution and knowing the market – then surely the buyside execution desks face a similar and parallel future to the 90% sellside traders previously discussed; creating and managing algorithms (/trading rules) in the machines that are doing the trading – in this case the buyside OMS. efinancialnews and fixfortechies says that Participants expect growth of automated execution in equities and foreign exchange to tip over into other asset classes, and also points out that while the use of algorithms to automatically execute trades is thriving in equity and derivatives markets, fixed income trading has failed to follow suit. It’s no surprise the article predicts that customers will utilise algorithms for government bonds before credit (my latest 2c on e- Credit in this waratah post), and that the fixed income algos move will only occur as a “next step” after the buyside conquer using their algos for foreign exchange. The mention of RFQs leapt out at me. Sticking to the existing RFQ model (i.e. “whats your price for this size in this specific security?”) surely means buyside never get to fully utilise algorithms for fixed income. If the buyside algo machine has to make its stock selection before doing price inquiry then surely it’s going to spend a fair amount of time spinning its wheels reqeusting and re-requesting executable prices, based on the indicatives it has used in working out that it is interested enough to request a firm price. It of course then also needs to send RFQ for every security that meets the criteria it is seeking (cpn, mty, drn, issuer, sector, …. and many more). So are the platforms and dealers really going to be able to deal with the number of “open” RFQs increasing exponentially just because an algo box has been plugged in? To really add full value the customer-facing algos actually need an executable stream of pricing of all of the inventory that is in scope for their trading decisions – as is commonly available for FX and also the markets where algos are already used – so the machine can do its magic then request execution with a good degree of certainty of getting it. The thing with the fixed income space is that given the breadth of inventory in FI space, multiplied by the number of dealers to contribute, I can’t help thinking this will only really work if customer indicates the attributes of the inventory they are interested in (ah, so something similar to that proposed in my post about executable bid lists then) rather than having to send hundreds of RFQs for specific securities just to get a truly executable price comparison… Then the dealers can respond with anything in their inventory that matches the attributes and which they can price in a way that comes close to meeting customer expectations in terms of the aggressive bid/ask spread achievable today using RFQ. So again I’ll conclude that new transaction types are required in order to take the market forward. But this isnt one of those flags in the sand for two years time. Surely the existing platforms could offer sellside customers an attribute search for inventory that comes back with executable pricing (so “just click to select which trade you wish to do”) is really not a huge step? They offer search functionality anyway, so it’s just down to sellside supporting the new order type behind the scenes – in order to [algorithmically] offer their true inventory out to customers. Back at that Tradetech I was waving the flag about a new service we’d launched that utilised FIX for fixed income, which made a significant process improvement to allocations on electronic trade flow. We’d plumbed the Bloomberg allocation screens (which customers use to send allocation instructions for their AutoEx trades) into our allocation engine via a FIX pipe, so the customer could actually interface direct with our engine rather than just msging a sales contact who’d then need to do something to manually book the shape and confirm when done. Two years on our service is still there, still used, but despite Bloomberg offering same functionality to all other dealers at no extra cost, I am told we are still the only dealer who is actually using this FIX connection rather than relying on their salesguys or middle office getting a msg and manually booking the allocations. This leads me to question whether FIX is as ubiquitous outside of OMGEO etc as is made out for fixed income allocations? Since that 2004 Tradetech we have established FIX connections in which our customers conduct their fixed income price discovery and electronic order flow. Yes, customers trading Fixed Income with us via FIX. Many sellside have said for some time “were ready for fixed income FIX as soon as customers want to use it”, but I’m referring here to real customers, real fixed income FIX connections, with real fixed income flow via FIX each and every day. But its generally just those customers using FIX to trade other products with us already and who have the organisational structure allowing them to leverage this existing connection – as the majority of FI customers remain more than happy to continue in the usual multidealer platforms at this point. If you read my blog then you already know I expect FIX to become the de-facto standard for connectivity on the customer side in the cross-asset space, but as this is driven by uptake of OMS, and specifically for etrading within the OMS, this is still some way off in terms of reach critical mass. As the FPL “process” to agree requirements and establish releases means FIX is only ever deployed in OTC space to replace whatever the original connectivity solution was, would moving to an open source development model mean product initiators could “do it in FIX ” from the outset rather than building their proprietary connectivity which will at some point in the fullness of time be supported in FIX? Surely once the guys at the coal face of developing electronic trading for totally new capital markets initiatives have the ability to deploy a full lifecycle FIX-based solution from day1, FIX would really work its way into the hearts and minds of the movers and shakers who sponsor these development projects? …at which point uptake would surely snowball. The OTC FX and FI electronic markets .. and so the current generation of pricing/trading systems .. were built upon the premise of using proprietary APIs, and these APIs have each evolved in-line as each liquidity pool has evolved over the years. So for existing market participants FIX will clearly need to do that connectivity better in order to be considered a candidate to replace any of this existing connectivity. Of course one “better” might be in the aggregation of disparate feeds and venues; e.g. the pitch of Currenex’s “OpenSTP/FX” (FIX-based STP protocol for FX, MM and precious metals), though this clearly only works as a standard if more than one of the liquidity pools offers it :-s (and even then this particular Currenex example is only really of interest to those who don’t have an existing STP capture in place). It’s not all doom and gloom. FPL has addressed some of its major issues in FIX though; with FAST aiming to shut up everyone who says FIX can’t cope with streaming data, and 5.0’s transport independence addressing the complaint that there are too many versions of FIX in use for it to really be a “standard” (- though is the irony that we still need everyone to update to 5.0 in order to actually use this?? ), the hurdle to using FIX appears now to be just a matter of “implementation” – shifting the problem from being a technical issue into a “FIX implementation” resourcing issue instead. It’s the new venues and market participants (and for examples of these see the “2015” category) that will drive the uptake of FIX in the OTC space. 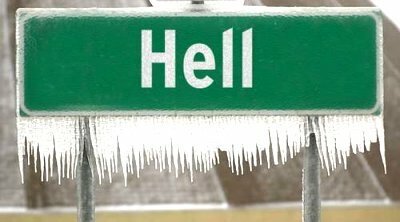 So in terms of that slide I was talking about at the start of this… while it’s definitely not freezing over in Hell just yet, I think it has probably got colder there in the last couple of years. (from Securities industry news) … A proposal by the U.K. Financial Services Authority to ban soft-dollar compensation of asset managers for the use of order management systems (OMS) and execution management systems (EMS) is running into sharp criticism. The FSA by including these systems along with electronic networks, dedicated phone lines and word processing software among “non-permitted services” in proposed guidance that is open for public comment until Dec 6, is diverging from a Securities and Exchange Commission rule issued in July that put front-office OMS and EMS in the “safe harbor” for soft dollars. However, because OMS can be classified as mixed-use–for purposes other than helping to execute a trade, such as analytics and compliance–the SEC did say that only the costs related to trade execution are permitted. It is unclear why the FSA did not take the same approach or differentiate between electronic systems that benefit broker-dealers versus those that benefit fund managers. Last year, when the FSA first issued its guidance, it did not explicitly exclude OMS and EMS from soft-dollar eligibility. So an EMS that acts as a pure aggregator for price discovery and execution +/- value-add algos — hence something specifically “helping to execute a trade” — but which did nothing else, would still be ok in the eyes of the regulators. Remaining on the same train of thoughts as my blog about OMS driving FIX uptake on buyside in fixed income space… where is a standalone Execution Management System providing a customer interface into the fixed income electronic markets (tradeweb, marketaxess, bondvision, and so on). Here I’m not talking about a full-rambo Order Management System, with full-rambo OMS functionality and price, but just the straightforward aggregation of etrading connectivity so customer runs EMS rather than each platforms separate application/workstation. This of course has same potential impact on FIX fixed income uptake on buyside, only sooner as theres clearly no reason to implement EMS if youre not also “doing” the connectivity piece. From technology perspective surely the EMS view is just about the aggregation of these markets into a single market-depth screen etc, with single (look-and-feel) order entry functionality, and a single feed into booking systems etc – something ION marketview (at least) has been doing on sellside for years. And with each of the platforms offering a FIX interface on customer side, this is actually then just aggregation of a handful of FIX connections – something existing EMS guys are clearly able to do. So is fixed income aggregation something the existing EMS guys have appraised and discarded- even though it could get their app onto customer desktop (even if only in “lite” form for FI)? It will be a shame if the concept of a dealer-independent EMS dies off just because of the tough sell to customers because of the commitment to use that providers algos in other product areas. FIX will become the de-facto protocol for fixed income order routing from a buyside perspective. But it is going to take a while so don’t hold your breath…..This year we’re seeing many more buyside firms implementing fixed income order management systems (OMS). But even with their own desktop (the OMS) from which they conduct proprietary value-add alpha-seeking decision making, it is still incredibly rare for customers to acknowledge a desire to imminently aggregate their participation in the electronic fixed income markets into this desktop. OMS are being put in place primarily for compliance benefits.With typical maximum integration between buyside systems and the etrading platforms currently to upload/download orders and trades via a spreadsheet, the platforms’ existing buyside FIX connectivity offering is clearly very little used at this point. But the FIX connection is there as and when the appetite to connect from OMS arrives. And in terms of bang-for-buck, customers clearly will connect to these platforms first – a conceptually simple change to existing workflow so you can “press a button to release the orders” to market rather than upload/download via spreadsheet.After that, with dealers offering that customer direct connectivity by way of a service enhancement/cost reduction exercise, we see a landscape similar to the equity world now – where individual customers connect to a few chosen dealers direct, and via market intermediaries (i.e. the platforms, above) to reach other pools of liquidity. This builds on the pipes and connections already in place from the OMS. These use FIX. So with the players coming onto the pitch in the form of the OMS being deployed in buyside, and the OMS vendors often being FPL members .. and the platforms already “offering” a FIX interface for buyside to connect for their order flow, it is surely an open goal for FIX to become the de-facto standard in this space .. in which case it’s just a matter of time…..